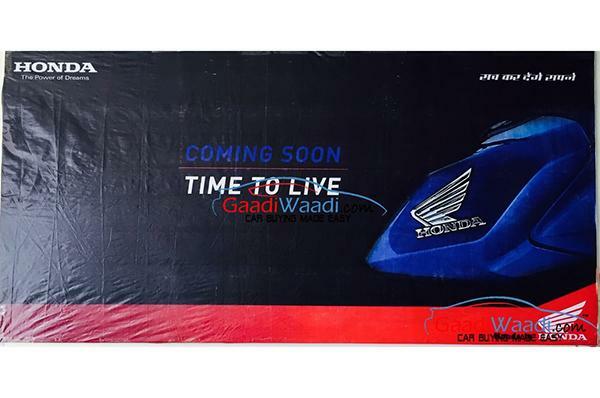 Popular scooters and motorcycles manufacturer in India, Honda, has put up big outdoor banners with previously reported “Time to Live” and “Coming soon” messages. What Honda Motorcycle and Scooter India (HMSI) is planning to do is- It is seeding the curiosity among Indian bike/scooter audience by glorifying these ads. However, information from dealerships and GaadiWaadi confirms that the upcoming two-wheeler would fall in commuter segment. The advertised bike which could possible be dubbed as Livo has been spotted testing several times in recent past. The banners have also been put up on different showrooms hinting that the Livo launch is not very far away. The Spyshots of Livo revealed by GaadiWaadi reveal that the motorcycle has got a single, very aggressively styled front headlight trying to retain Honda’s famous design language. The leaked images also reveal details on angular, analogue instrument console which displays speedometer, odometer as well as the fuel gauge; the entire unit of Livo looks pretty unique and well-thought out. Honda Livo appears to be in sync with the design of the current crop of commuter motorcycles by Honda in India, including the CB Twister. The Livo engine is expected to come with single-cylinder, 109.19cc, air-cooled and 4-stroke unit which was first seen on the Honda CB Twister. Just to give a better idea for you, Honda Twister produces 9bhp of power at 8000rpm and 0.9kgm of torque at 6000rpm.